NEW ROUTE FOR CJ’S 2019!!! That’s a 1.5-ish mile loop with what I think is a pretty fun mix of terrain! 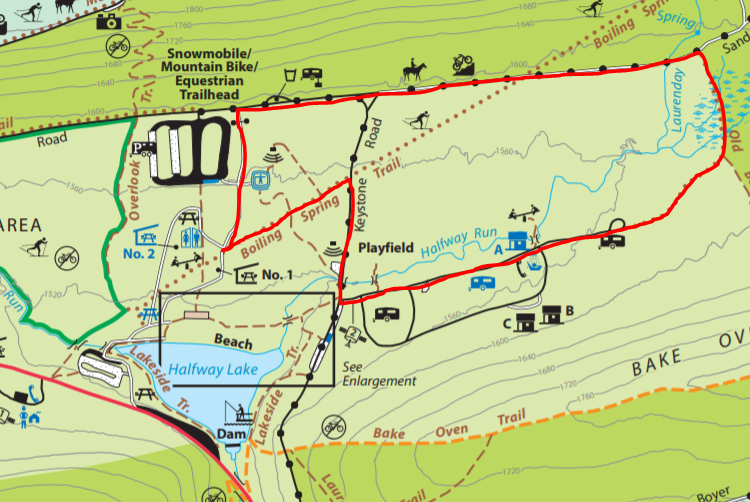 Looking at the map, it is a counter clockwise loop. There are some downhills to help you speedsters make up time for getting hung up in mud. The trail portions are still in the Natural Area and are still wet, just not as wet as our old loop. We will route you around the largest of the puddles, but you should expect to get wet and muddy. Bring extra clothes, shoes, and maybe a towel for your drive back home. The entire course is contained within R. B. Winter State Park at 17215 Buffalo Road Mifflinburg, PA 17844. The start is near Pavilion 1. Participants head west on Boiling Spring Trail then continue on Rapid Run Nature Trail. Instead of turning back into the Rapid Run Natural Area, continue onto Sand Road which is paved. Participants will follow Sand Road approximately seven tenths of a mile before turning right and then another quick right back onto Boiling Spring Trail and back to the Pavilion to complete one loop, which is roughly 1.6 miles.